I've been reading this 96 page book for months. That's because it was my purse book. Do you have one of those, ladies? The wise Lemony Snicket once said, "Never trust anyone who has not brought a book with them." You never know when you're going to end up in a situation where you have much more time to kill than you planned. I always try to have a book. In a larger purse, most regular sized books will fit. But in my small crossbody bags, I had to carry something tiny. 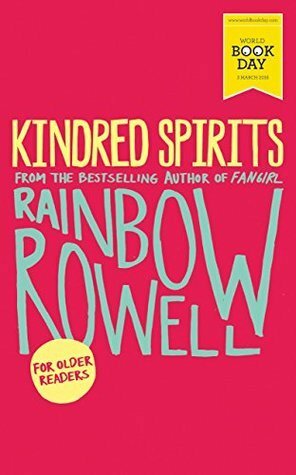 Enter Kindred Spirits! This was such a cute little story, and I've been reading it at the right time. As you might have recently seen on the blog, I'm going through a phase of reading books about finding love at cons. This is not exactly that story, but it's pretty close. Elena and Gabe were fun to read. And so was Troy! I understood the nerdiness, the idea of fun that comes with camping out, the having to pee when you're sleeping outside in a line...I've been there. This book might me smile and nod and laugh. It won't take most of you several months to read -- in fact, it might only take you several hours, if that. So I definitely recommend you give yourself the slight detour of your current read and take this one in.